After a quiet start to the year we've found some excellent Xbox One X prices. We're talking brand new bundles with the hottest games like The Division 2, Metro: Exodus, Forza Horizon 4, Battlefield V and more. Gamers looking for the most powerful console ever made have have been keen to pick up Xbox One X deals since release but there was a high cost to pay in the early days. Until recently, prices have been high at most stores if you weren't sure where to look. That's where we come in as our dedicated team of Deal Hunters cut through the chaff to bring you only the very best Xbox One X deals every day, and we've got some excellent ones for you today. In this article you'll find a comparison chart with the lowest prices on where to buy the 4K HDR Xbox One X console from a wide range of the best retailers. After the comparison chart we've put together a collection of the latest bundles in the States and UK. These Xbox One X bundles will save you money over buying the items separately. If you're after information on the latest Australian deals, head over to our Australian page. US Xbox One X bundles are really stepping things up now after a quiet few months. there's never been a better time to buy actually as you're getting genuine discounts and free content for the first time in ages. There are few mega cheap Xbox One X prices around this week with a $389 bundle including being a theme we can thoroughly get behind. This is a great option for basketball fans, but if you fancy a bit of local multiplayer too, then check out the bundle below instead. Walmart has just knocked a tasty $60 off what was already a decent Xbox One X bundle. You're getting two controllers here along with NBA 2K19, which is super fun in local multiplayer. This is another cheap Xbox One X bundle, but in all honesty, compared to the other games available at this price-point this one's not quite as good value. PUBG has been out for a while, so is very cheap to pick up separately. As seen in our PUBG prices guide. While there are far cheaper Xbox One X deals available today, this is actually a decent price for a limited edition console. We're just ignoring the fact that it's a bit ugly. Mainly because it also comes with the Deluxe Edition of Battlefield V, Battlefield 1943 and Battlefield 1. While $50 less than it was last week, there's still a strong argument for opting for one of the other Xbox one X deals above this week instead. That's because many of them are more than $60 cheaper than this one, meaning you could just buy The Division 2 yourself and still save money by getting a different bundle. Unlike Anthem, The Division 2 has had a solid launch, which we're not really used to nowadays with online shooters. So if you've been waiting to reclaim Washington it's time to suit up with this bundle that's £70 cheaper today. A tempting deal for the brand new Metro Exodus along with the remastered Redux versions of the previous games so you can enjoy the whole trilogy in glorious 4K. The days of paying £450 for the Xbox One X alone are thankfully far behind us. This very tempting Xbox One X deal throws in two brand new games and an extra controller adding around £120 worth of extra value to the bundle. Like the Xbox One X deal above but swapping out The Division 2 for the new Metro Exodus game. But you also get the Redux re-releases of the first two Metro games too. This new Xbox One X bundle comes with a new style of console with a cool gold to black fade on top (it's a bit 'Marmite' for sure). Better yet it comes with a free copy of Battlefield V: Deluxe Edition which would set you back an eye-watering £70 if bought separately. We've never seen this bundle on sale for less either. Given how much of a panning Fallout 76 has had from fans and critics alike though, we'd be tempted to pick up a different deal. You can always buy Fallout at a later date for a super cheap price. This is the first time a white Xbox One X has been made available and it comes with a full game download of Fallout 76. To be honest though, given how Fallout 76 has flopped, you may want to consider a different bundle unless you really must have the white version of the console. The Xbox One X MSRP is $499 in the US and the UK RRP currently sits at £449. So sure, it looks like UK gamers are paying considerable more as the direct currency conversion would have it at £390. On the plus side, retailers are starting to cut prices and we're seeing games bundled in too. So you should never pay those costs for the console alone today. Just to be clear, this is not what you'd call a 'next-gen' console. Instead it's a powerful upgrade over the current Xbox One lineup. To simplify things, it's akin to Sony's PS4 Pro. Both consoles are aimed at gamers with a 4K HDR TV who want the best graphical performance possible on their favored console. There will be modest performance boosts on non-4K TVs too, but you're kind of missing the point without a 4K HDR TV. As things stand the Xbox One X will play all Xbox One games and we're not expecting to see any games released exclusively for the Xbox One X (or so we've been told), so there's certainly no reason to throw away your Xbox One S yet. The Xbox One X is the most powerful console ever made though, even outshining some of the specs of the PS4 Pro. But given the huge asking price, you'd hope as much. 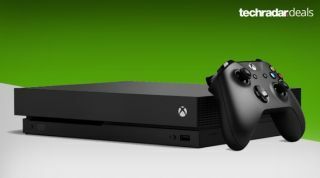 The Xbox One X is making bold claims about true native 4K gaming though with its upcoming titles and if you have a 4K TV with High Dynamic Range (HDR) technology, the Xbox One X is ready to seriously impress with the likes of Forza Motorsport 7, Metro: Exodus and Anthem set to be true jaw-droppers in the graphics department. Where can I buy an Xbox One X? Most of the usual big name retailers are stocking the Xbox One X. Prices this close to launch are all very similar for now, but as we move forwards, we'll start to see stores chipping away at the price to try to get an edge over the competition. Keep an eye on the highlighted Xbox One X bundles above and our comparison chart, which we'll keep up to date on the latest prices for the Xbox One X on its own. So feel free to bookmark us and check in again soon to see if we've found the deal that's right for you. Fingers crossed the bundles get better soon, especially in the US where we're not seeing massive software discounts so far. What is the Xbox One X release date? It's here now! The Xbox One X came out on November 7 2017. That was a worldwide release date too. Will there be Xbox One X deals are Christmas? Unlike the first Xbox One X's first Christmas, we do expect there to be some deals this year. The 4K console was seemingly too new to discount last year, but Microsoft will be keen to catch up the the PS4 Pro this year and we're hoping for some decent discounts in what has been a slow year for deals in all honesty. In all likelihood, the PS4 Pro prices and bundles are still going to be much cheaper. What if I don't care about 4K or want to save money? The standard Xbox One S is a fantastic games console and you'll easily be able to get one with a few games for around $250/£250 or less. There are cheap deals all year round on our Xbox One deals and PS4 prices, deals and bundles pages. Only kidding. I want 4K HDR in my face right now. 4K TVs with HDR are nowhere near as expensive as you'd think. The prices have come down much faster than the original HD TVs, so you can get a decent model for a low price. Hell we've seen some nice ones for less than the price of the Xbox One X itself (what a ridiculous world we live in). For the best of the best, take a look at our best TV article. We've also rounded up the best cheap 4K TV deals too in the UK, and also a collection of US TV deals. How big is the hard drive in the Xbox One X? For now, the only option available is the 1TB option, that's 1000GB of storage. There are no official plans for larger versions, but we wouldn't be surprised to see these come along in 2018. With some 4K-friendly update patches to games coming in at over 100GB, we certainly wouldn't hold out for a cheaper 500GB Xbox One X, as it'd be a bit pointless to be honest. We think gamers are going to fill up the 1TB Xbox One pretty soon. Thankfully the Xbox One X is compatible with external hard drives using USB 3.0. So if you need some extra storage, check out our list of the best external hard drives.